Everyone has the opportunity to Say Yes! to Good Healthy Food in Schools. 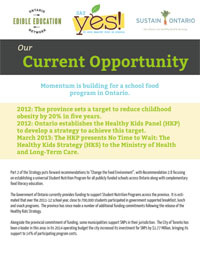 In March 2013 Ontario’s Healthy Kids Strategy recommended a universal Student Nutrition Program for all Ontario publicly funded elementary and secondary schools. 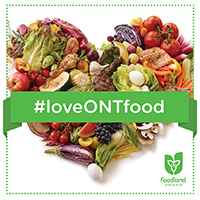 The recommendation put forward that programs should provide food literacy education including learning about where food comes from, the hands-on experience of cooking, and links to the school curriculum. To build on this momentum, Sustain Ontario’s Edible Education Network has developed a toolkit of case studies, fact sheets, presentations, messages and stories to help decision-makers envision how a stronger school food environment could be advanced in Ontario. We hope that parents, teachers, program providers, and other advocates will be able to use these resources to make the case to their provincial, municipal, and school decision-makers for stronger school food programs for all of our kids. 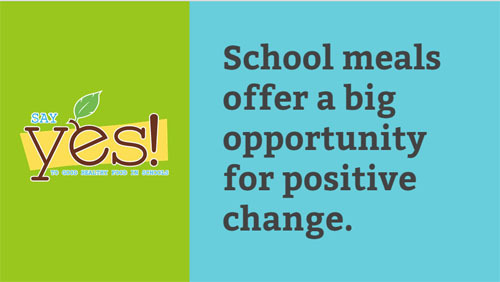 Our Current Opportunity: A 2-page brief that provides background information about how our current moment in time offers a significant opportunity to advance good, healthy food in schools. 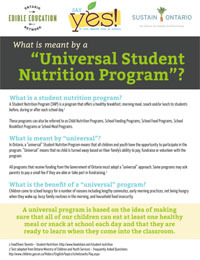 What is meant by a “Universal Student Nutrition Program”? : A 2-page brief that discusses the merits of a universal program that is accessible to all students within a school. 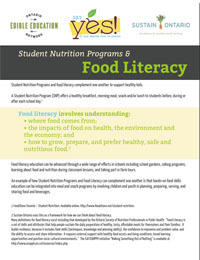 Student Nutrition Programs and Food Literacy: A 4-page brief that discusses meal programs and food literacy as complementary initiatives that support healthy eating among children and youth. The brief also puts forward how school food programs can advance significant health, education, community and economic priorities. Opportunities to Say Yes! 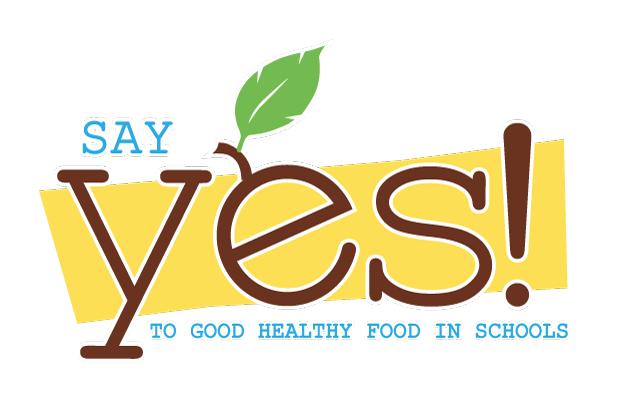 to Good Healthy Food in Schools: A series of 1-page briefs that put forward opportunities for key policy decision-makers to Say Yes! to Good Healthy Food in Schools. Advancing Good Healthy Food in Schools: Envisioning How a Healthy School Food Environment Could be Moved Forward in Ontario: A 20-page document that provides a range of ideas for how good, healthy schools could be advanced in Ontario. Are you a school food advocate? Key Messages re: Say Yes! to Good Healthy Food in Schools: Whether you’re planning to meet with policy staff at the provincial level, present at a meeting of school trustees, or ask questions when your municipal candidate comes to your door it’s critical to have your 2-3 priority messages at your fingertips. Here are some key messages that you can use to make your case for good healthy food in schools. About Student Nutrition Programs: This 2-page template can be adapted to your own city, town or region to educate your local decision-makers about how Student Nutrition Programs work. This project was made possible through funding from the Heart and Stroke Foundation.